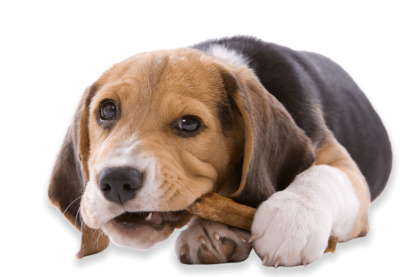 Bully sticks make great treats for dogs, especially those who love to chew. These treats promote natural dog cleaning by reducing tartar and plaque buildup. They also prevent cavities, gingivitis, and other periodontal diseases. Aside from dental benefits, bully sticks are a rich source of protein. They are 100% digestible because they are made of pure beef pizzle, unlike rawhide chews and treats that may contain additives and chemicals. On the other hand, because bully sticks are made of natural ingredients, they tend to have a strong smell. 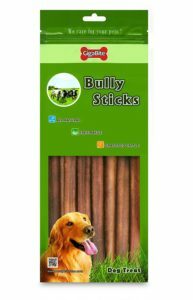 If you want to give your beloved pet the best treat but hate to have your house smelling like manure, here are the best odor free bully sticks you can buy online. 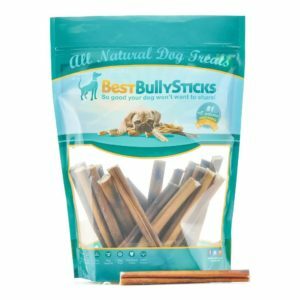 Why I like it: Best Bully Sticks is one of the top companies offering high-quality bully sticks and pet treats that are made of wholesome ingredients. I like that these natural Angus bully sticks are hand-inspected and sourced from USDA and FDA approved Brazilian beef. Because they are all natural, they are not totally odor-free. They still have a light smell. These bully sticks are 6 inches in diameter, making them perfect for puppies and small dogs. If you have a large dog, you may want to get these in 12 inches. Customers in Amazon love these bully sticks because they help their dogs have nice-looking pearly white teeth. Have a puppy who loves to chew? You may also want to check out the Best Natural Bully Sticks for Puppies. Why I like it: These bully sticks are made of 100% all-natural beef pizzle sourced from free-range, grass-fed USA bull. These chewable treats range in 4 to 5 inches in length and are thin. This makes them great for small dogs. If you have a small dog below 7 lbs., they can last around 30 minutes to an hour. Because they are smaller in thickness, they are easier for tiny dogs to grip while chewing. Peppy Pooch also gives a 100% no-questions-asked guarantee. Why not try these out now? It’s totally risk-free! Why I like it: Best Pet Supplies is one of the few companies that are committed to producing low-odor bully sticks. I like that this company thoroughly cleans the bull pizzle, dries it under the sun, and gives it a slow roast for a flavorful and almost odorless treat! These bully sticks come in a range of sizes from 6” to a full 36” so you can find the perfect diameter and length for your dog. If you are looking for huge bully sticks that will keep your furry friend busy chewing for a long time, then give this product a try. 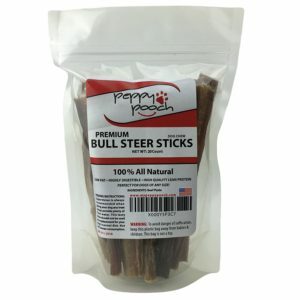 Best Bully Sticks, Peppy Pooch and Best Pet Supplies are some of the best odor free bully sticks brands. Although these bully sticks are branded odor-free, please keep in mind that they still have a little smell. The great thing about them is that they are made of 100% natural ingredients with no additives and chemicals. Some treats are processed with chemicals to remove the smell – these are not! If you are looking for the best deal for your money, you can compare their prices on Amazon. You might also want to read our review on the best natural bully sticks for puppies.